from my shelves, scorned, ridiculed and often dismembered by one of my brothers. But I believe there is a princess in every girl. I see this more clearly now that I have granddaughters. Brooklynn turned three in August and spent the day in her various princess dresses, even climbing and tumbling in them, uninhibited by any menacing brothers. When she puts on her princess outfits, I see her transform. 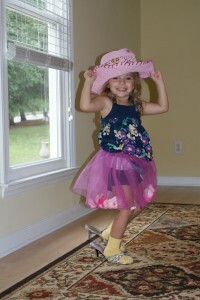 She understands that she can be beautiful, feminine, and the apple of her daddy’s eye. In the right setting, with a stable and loving father who mirrors her beauty, inside and out, which she is fortunate to have, this is a very healthy insight. In the wrong setting, as the TV show “Toddlers and Tiaras” portrays, it is the beginning of a frightening trend towards narcissism, insecurity and confusion. am wearing my princess dress. And I am probably doing cartwheels too. If you want to know what’s close to my heart, check my fridge. Not the inside, the outside. It’s covered with magnets from places I have traveled, photos of friends afar, a picture of me and my mom and some funny sayings I’ve found and captured using the magnets. What got me thinking about my fridge was thinking about this Blog. 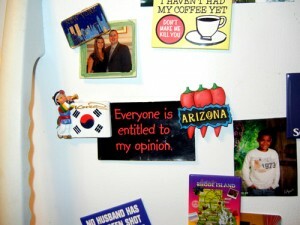 One of the magnets reads: Everyone is entitled to my opinion. Considering my mother’s nickname for me as a growing and very verbal child was “Last–Word-Lucy”, it’s an appropriate adage for my Blog. And I’m a little embarrassed to admit it. I’ve always wanted to be demure and soft-spoken, with a meek and humble spirit. Well, not always. Let’s say since I became a Christian and read about the Proverbs 31 woman. Just like I always wanted fine straight hair, wispy and feminine. It took me about five years of hard time in the back forty after I gave my life, the whole lovely mess, to Jesus, to learn that I was not fashioned that way; soul, spirit or hair. The Potter has patiently turned that wobbly lump of clay over the years, smoothing and refining with careful attention, then often getting out the chisel. The last ten years I believe the whole thing was smashed, brought down to an unrecognizable lump again and remade. 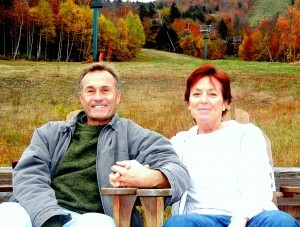 What steadfast love the Master has! I don’t expect you to be as patient with me as my Father. And I still strive to be…well, at least a little wiser with my words. But remember my fridge, OK? If you come back again you will always be entitled to my opinion.